Several countries in the Middle East region are still recovering from slump in oil prices since 2014. Steadily increasing oil prices and burgeoning construction sector contributed significantly to the growth and development of the region post 2016. Additionally, preparation for international events such as Dubai Expo 2020 and FIFA World Cup have resulted in growing investment in the construction as well as industrial sectors. Due to ongoing arms race among the Middle East countries to own a fleet of combat UAVs, several manufacturers are anticipated to take the advantage of underlying opportunity. According to 6Wresearch, Middle East Unmanned Aerial Vehicle (Drone) Market is forecast to grow at a CAGR of over 30% during 2018-24. As a result of upcoming events in the Middle East region, the construction sector is registering positive growth on a year-over-year basis. Increasing deployment of drones in the construction sector for land mapping grew significantly over the past few years. Acceptance and adoption of drones by the government of UAE, Kuwait, Qatar, and Israel have encouraged consumers and commercial end users to invest in the UAVs. Moreover, “Media houses increasingly deployed multi rotor drones for the coverage of live events such as sporting events, natural disasters and accidents due to low cost of operations of these drones as compared to manned helicopters,” He further added. 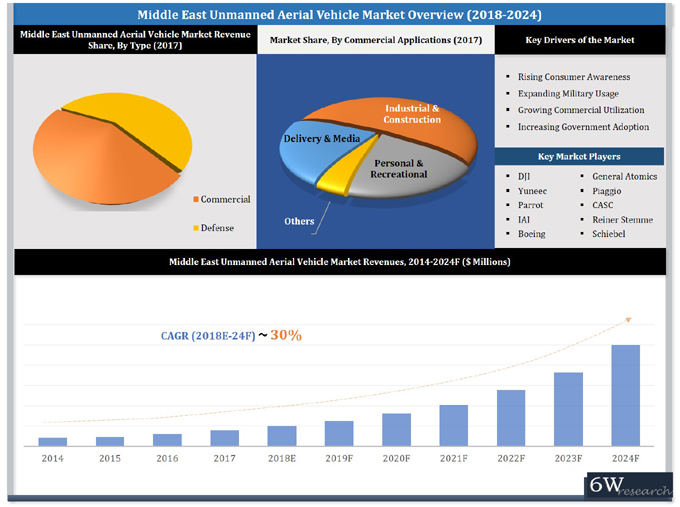 “Middle East Unmanned Aerial Vehicle Market (2018-2024)” provides in-depth analysis with 48 figures and 36 tables covered in more than 135 pages. The report estimates and forecast the overall UAV market by revenue, sales volume, type, applications and countries. The report also offer insights on competitive landscape, market share by companies, company profiles, market trends, market drivers and restraints. Power sector in India is witnessing a radical change on account of government’s move towards power generation via renewable energy resources. Increasing electricity consumption and surging awareness towards environment are together helping the country towards utilization of green energy resources, especially solar. 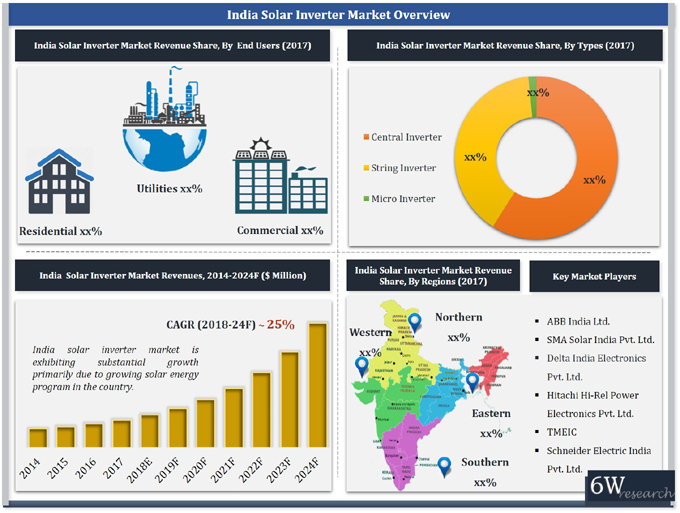 Moreover, solar inverter market is exhibiting immense growth over the past few years owing to surging implementation of solar energy projects in the country. Additionally, National Solar Mission, aiming to achieve 100 GW of solar energy by 2022 has further fueled the solar inverter adoption and is anticipated to increase the market in proportion with uprising solar industry in India. According to 6Wresearch, India Solar Inverter market is projected to grow at a CAGR of over 25% during 2018-24. Among different types of solar inverters, central solar inverter bagged maximum revenue share in 2017 owing to its significant deployment across large scale utility solar projects in the country. However, during the forecast period, string solar inverters are anticipated to exhibit highest growth rate attributed to rising demand among residential and commercial solar installations for its smaller size and high power density. “Increasing electricity prices, rising investment in smart cities, and increasing awareness among consumers have further led to the expansion of solar inverter market in the country,” Anuj concluded. “In addition, through subsidies and incentives, government is making remarkable efforts to utilize the solar power capacity in the country. Also, government’s focus towards smart cities development is likely to contribute to solar energy adoption which would increase the demand for solar inverters in the country,” Suman added. Some of the major companies in India Solar Inverter market include- ABB India Ltd, SMA Solar India Pvt. Ltd, Delta India Electronics Pvt. Ltd, Chint Electric India Pvt. Ltd, Schneider Electric India Pvt. Ltd, Hitachi Hi-Rel Power Electronics Pvt. Ltd, and Toshiba Mitsubishi-Electric Industrial Systems Corporation. Massive investment flow and incentivized support to local and foreign investors led to a massive growth in Ethiopian air conditioner market in 2016. Ethiopia attracted $3.8 billion in foreign direct investment in the Ethiopian Fiscal Year (EFY) 2016/17, registering a 20% increase from EFY 2015/16. In the 2016/17 fiscal year, 381 projects became operational. However, after a year of tremendous growth, Ethiopian air conditioner market contracted in 2017 amidst the devaluation of the country’s currency (Ethiopian Birr); the National Bank of Ethiopia (NBE) announced a devaluation of ‘birr’ by 15% resulting in payment delays. According to 6Wresearch, Ethiopia Air Conditioner market is forecast to grow at a CAGR of 15.8% during 2018-24. In last fiscal year, 28 companies with a combined capital of $1.5 billion made an agreement with the Ethiopian government for eight industrial parks. Rising investment in projects primarily engaged in manufacturing, health, education and construction sectors would further elevate the growth of air conditioner market. Furthermore, Ethiopian government’s five-year Growth and Transformation Plan II (GTP II) for the period 2015-16 to 2019-20 relies heavily on the construction of modern structures and amenities which has further resulted in embarkment of construction activities in the residential and commercial sectors in the nation’s capital, Addis Ababa. “Additionally, centralized air conditioner was the fastest growing segment with VRF leading the demand. VRF systems were highly popular among residential and commercial applications, while chiller segment gained a quick acceptance in manufacturing and industrial applications owing to high capacity requirements in these applications,” Samuel further added. “Moreover, Addis Ababa was the prime location for the development of high-rise residential buildings and commercial compounds. Large residential development emerging at the outskirts of the city, office complexes and government buildings in the areas located at the center of the city led to a strong growth for air conditioner market in the residential and commercial applications,” Rishi further added. Key contributing vendors in Ethiopia air conditioner market include- Samsung Electronics East Africa Ltd., LG Electronics Inc., Awal Gulf Manufacturing Co., Daikin Middle East & Africa FZE, Carrier Africa FZE, and Gree Electric Appliances Inc.
“Ethiopia Air Conditioner Market (2018-2024)” provides in-depth analysis with 69 figures 3 tables covered in more than 125 pages. The report estimates and forecast the overall Ethiopia air conditioner market by end-use applications, product-types and regions. The report also gives key insights on competitive landscape, market share by companies, market trends, market drivers & restraints, and recommendations. According to Ravi Bhandari, Assistant Manager, Research and Consulting, 6Wresearch, “Street Light LED’s holds the major share in the overall LED lighting market and expected to dominate the market in the forecast period. Government of India, under Street Light National Programme (SLNP) has to replace 35 million conventional streetlights with LED lights by March 2019, thus increasing the demand for LED bulbs in street light application.Further, the demand for LED down lighters have also increased due to growing adoption in the areas of hospitality, retail, educational institutions, commercial offices and others,” Ravi further added. 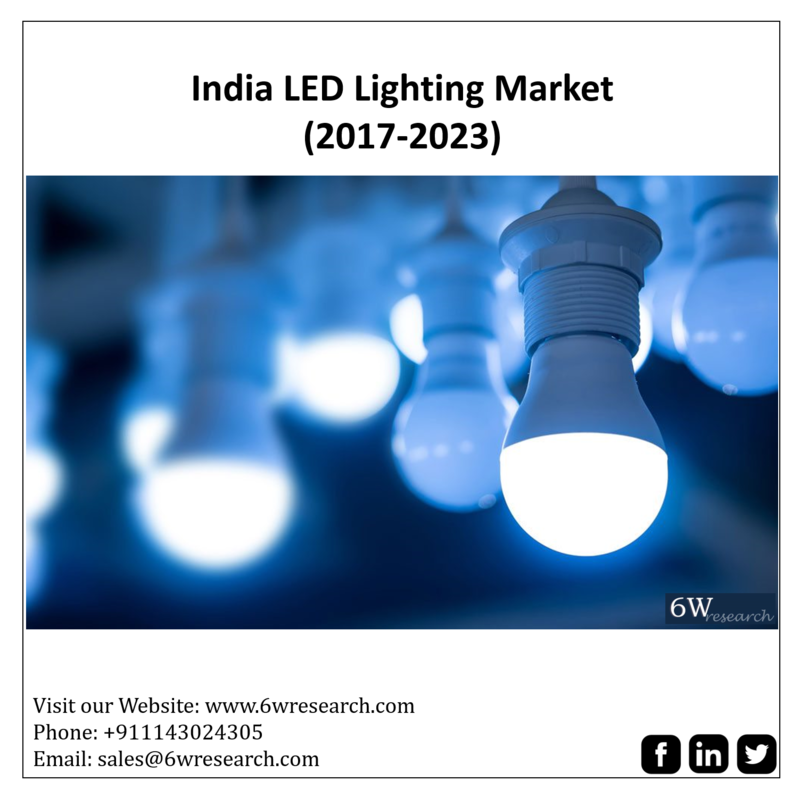 According to Kanika Sharma, Research Associate, Research and Consulting, 6Wresearch, “In India, LED luminaires are registering key growth and expected to dominate the market in forecast period. The demand is being driven by modernization, urbanization and adoption of better life style of the people. Commercial Sector is also spurring the market for LED luminaires. Profit margins of the market players have decreased due to growing competition and entry of new players in the country in the last few years. Further, the government is encouraging domestic manufacturing, which would further lead to price competition in the industry,” Kanika Concluded. “India LED Lighting Market (2017–2023)” report provides in-depth analysis with 40 figures and 13 tables covered in more than 120 pages. The report estimates and forecast the overall India LED Lighting market by types, wattage, applications, end users and regions. The report also gives the insights on competitive landscape, company profiles, market drivers and restraints. “Cyber-related risks are a global threat” as described precisely by the honorable Prime Minister Shri Narendra Modi while addressing the need to build credible cyber security systems amidst the changing threat landscape as India gears up to face cyber security threats. Cyber-security threat landscape in India has evolved over the past few years. During the past four years, India registered over 1,90,000 cases of cybercrime incidents. At present, Cyber-security market in India, stands around $4 billion with the industry exhibiting a growth of over 100% during the similar period. Growing number of internet users and proliferation of mobile and personal computing devices in the country resulted in increased threat level among the users, consequently, leading to growth in demand for antivirus software. Additionally, awareness among several end-users are increasingly rising, urging the users to opt for paid antivirus software solutions; enterprises increased their security budgets and have started investing heavily in these solutions. According to 6Wresearch, India antivirus software market is forecast to grow at a CAGR of 13.4% during 2018-24. With the wave of IoT and Digitization approaching the Indian sub-continent, antivirus software market is expected to follow an upward trend in near-future. Sales of personal computing and mobile devices are expected to surge and investment to boost the digital infrastructure of the country; implementation of cyber-security projects likely to ramp-up further leading to growth of antivirus software market in the country. Ministry of Electronics and Information Technology (MeitY) mandated all other Ministries to earmark 10% of their IT budgets for security spending. “Additionally, the individual segment is still dominated by availability of open source and freemium antivirus solutions in the market. However, the segment witnessed a shift in purchase of paid antivirus software with rise in awareness level. Also, growing mobile user base opened-up significant opportunities for market vendors to leverage upon and is likely to boost the revenues generated from the segment. Market vendors are partnering with telecom vendors to offer solutions based on subscription-based model,” Samuel further added. “Moreover, Tier-II cities are emerging as the hotspot for start-ups, IT Hubs and BPOs. Government initiatives are leading to increased ICT adoption in these cities making them as a preferred destination for PC and smartphone vendors. Demand for antivirus software is projected higher among these cities as they emerge as breeding grounds for tech start-ups and IT hubs,” Rishi further added. Key contributing vendors in India Antivirus Software Market include – Quick Heal, Trend Micro, Kaspersky Lab, ESET, eScan, Symantec, Bitdefender, McAfee, Sophos, and F-Secure. “India Antivirus Software Market (2018-2024)” provides in-depth analysis with 55 figures covered in more than 135 pages. The report estimates and forecast the overall India antivirus market by revenue, end-users, product-types, applications, regions, sales channel, and categorization based on Tier cities. The report also offer key insights on competitive landscape, market share by companies, market trends, market drivers & restraints, and recommendations. The growth of elevator and escalator industry substantially depends upon the construction outlook of the country. Though, Singapore elevator and escalator market recorded sluggish growth over the past few years, owing to declining construction sector, especially in the residential segment. However, it is anticipated to gain significant momentum post 2018. This growth would be majorly attributed to the recovery of construction sector along with continuously rising demand for maintenance services by huge installed base of elevators and escalators in the country. According to 6Wresearch, Singapore elevator and escalator market is projected to grow at a CAGR over 4.2% during 2017-23. The market would be buoyed by commercial segment applications including corporate offices, malls, transit systems, hotels, and hospitals. Moreover, escalator market segment is demonstrating high growth for the past few years owing to growing automation needs and for convenience of commuters. Additionally, in terms of service market, new installation service segment contributed majority of the revenue share, nevertheless, maintenance service segment is estimated to exhibit higher growth during the forecast period; this high growth is accounted to strict norms by Building and Construction Authority (BCA) regarding periodic maintenance of elevators and escalators across all the verticals. “Moreover, manufacturers are continuously coming-up with up-gradation in elevator and escalator systems. For instance, to meet the demand for high-rise buildings and for time saving of commuters, companies are coming-up with fast speed elevators such as introduction of elevators with speeds of up to 420 meters per minute by Fujitec Singapore Corporation Ltd.,” Shefali concluded. “Furthermore, for safety reasons, increasing instances of elevator & escalators related accidents in the country and strict BCA norms, the maintenance service segment is projected to grow over the coming years, which in turn would drive the growth of elevator and escalator market in the country over the next 3-4 years,” Suman added. Some of the major companies in Singapore elevator and escalator market include- Hyundai Elevator, Hitachi, Kone Corporation, Mitsubishi Electric, Otis Elevator, Schindler, and ThyssenKrupp. “Singapore Elevator and Escalator Market (2017-2023)” provides in-depth analysis with 38 figures and 6 tables covered in 100+ pages. The report estimates and forecast the overall Singapore elevator and escalator market by types, services, and verticals such as residential, commercial, and industrial. The report also offer insights on competitive landscape, companies benchmarking, company profiles, market drivers and restraints. Indonesia government is set to develop the country’s automotive, petrochemical and agro-based industries, which would strengthen the industrial and agricultural sectors in Indonesia. As gas gensets have lower operational costs and are more environmental friendly solutions as compared to their diesel counterparts, more number of industries are adopting the trend of using natural and bio-fuel based gas gensets for power backups. Expected growth in the industrial and agricultural sectors, as a result of government development plan such as National Long-Term development plan would help the high-speed gas genset market to grow over the coming years. According to 6Wresearch, Indonesia 1,000 kVA – 2,500 kVA High Speed Gas Genset Market is projected to grow at a CAGR of 2.4% during 2018-24. The hospitality and transportation sectors of the country are expected to register substantial growth during the forecast period on account of rising international tourist arrivals. This would lead to an increase in demand for high speed gas gensets from the commercial segments in the country. “In Indonesia, the agriculture sector is expected to witness highest growth over the coming years on account of spurring demand from palm oil and rubber industries. Such industries use waste gases in the form of bio-fuel to refill gensets,” Priya further added. Some of the key players in Indonesia 1,000 kVA – 2,500 kVA High Speed Gas Genset Market includes- Mitsubishi Heavy Industries Engine System Asia Pacific Ltd., General Electric, Caterpillar Inc., FG Wilson Asia Pte Ltd., Kohler Power Systems, Cummins Inc., MTU Onsite Energy Corporation, Deutz Asia-pacific (Pte.) Ltd., P.T. Siemens Indonesia and Doosan Heavy Industries & Construction. “Indonesia 1,000 kVA – 2,500 kVA High Speed Gas Genset Market (2014-2024)” provides in-depth analysis with 49 figures and 5 tables covered in more than 100 pages. The report estimates and forecast the overall 1,000 kVA – 2,500 kVA High Speed Gas Genset Market by revenues, kVA rating, regions and applications such as commercial, industrial and agriculture. The report provides an unbiased and detailed analysis of the on-going trends, opportunities/high growth areas and market drivers which would help the stakeholders to device and align their market strategies according to the current and future market dynamics.